My interest in pickling has no bounds. This is my MIL's way of pickling elumichangai oorugai. While a fresher, my husband taught this to me. Turmeric powder - 4 tsp. (long variety) - 75 gms. Wash lemons and pat it dry with a clean towel. Cut 40 lemons to cubes. Squeeze juice from 10 lemons and keep aside. 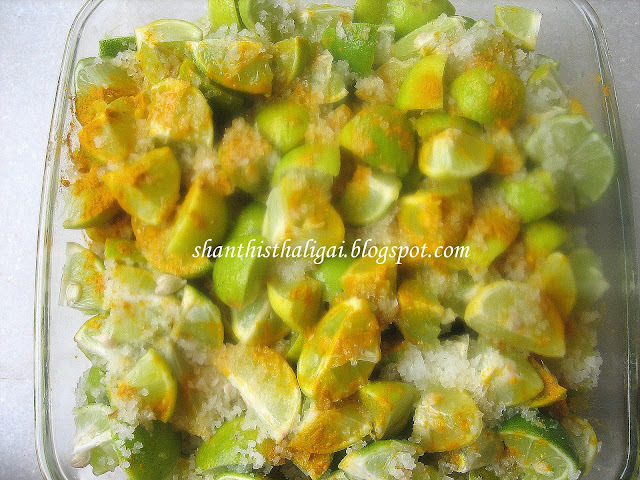 In a clean dry bowl, put a layer of cut lemon and then a layer of salt and turmeric powder. Repeat this till all the lemons are finished. (If doing in small quantities, you can follow this step). Add the juice of 10 lemons now. Mix well. Transfer it to a sterile bottle and close the lid. Mix well daily, using a dry spatula, for 5 days. After 5 days, the pickle will absorb all the salt and become soft. Heat a kadai, add 1 ladle of oil and roast the chillies without burning it. This is the important step. 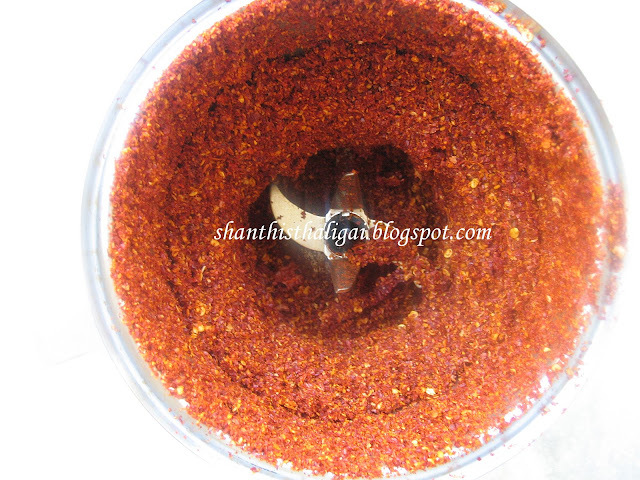 When cool, powder the chillies to a powder as shown below. It should be neither fine nor coarse. Heat the remaining oil, add mustard seeds and hing. Allow mustard seeds to splutter. Take it off the stove and when lukewarm, pour over it. 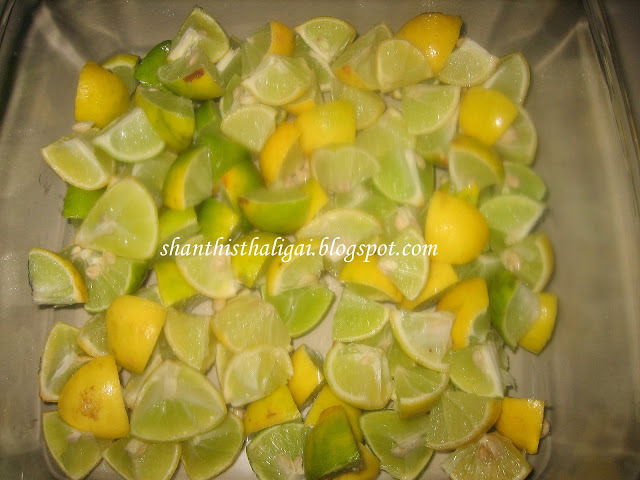 Mix well and when cool, transfer it to a sterile bottle or clean jar (jaadi). Make sure that there is oil above an inch of the pickle. This can be preserved even for a year. NOTE:(More salt can be added if the lime is too sour). This looks so yummy, I am simply drooling over it Shanthiji. Just by looking at the pictures it looks so tangy to taste......thanks for sharing this. Very tangy pickle! Slurp! I could have it with curd rice right now! Hi, Thank you for vising my blog and for your nice comment. 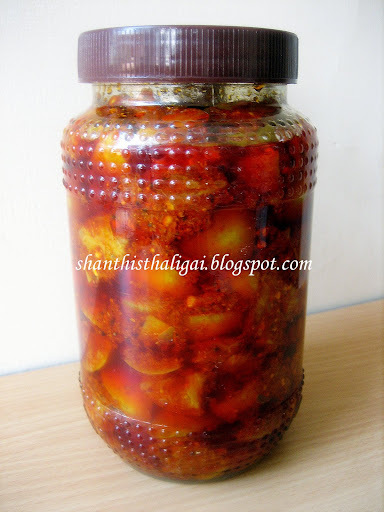 You seem to have lot of great recipes..Good to see a nice recipe for pickle..I'v never made any pickle..guess, I would make it soon with this nice recipe..btw, nice picture..
Wow! This pickle looks absolutely mouthwatering. 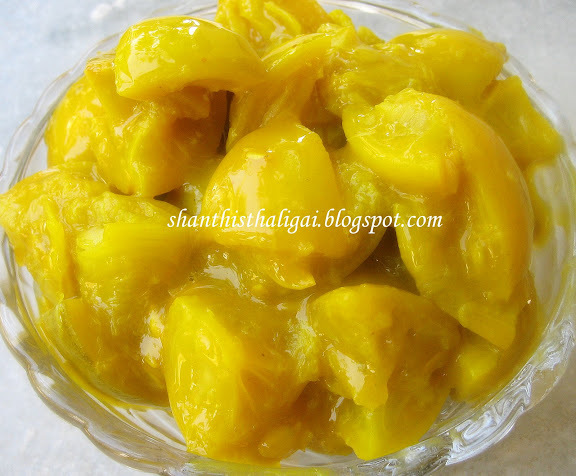 lovely lemon pickle,my all time favourite. Looks so delicious, my mom also makes it the same way. This pickle is giving me mouth watering experience,wow got to try this.. Happy Blogging n Enjoy Cooking!!! once i tried lemon pickle at home without oil n it lasted for 15-20 days but nxt time i'll try this version with oil so tht i can hv it all yr long. What a lovely recipe for preserving lemons! 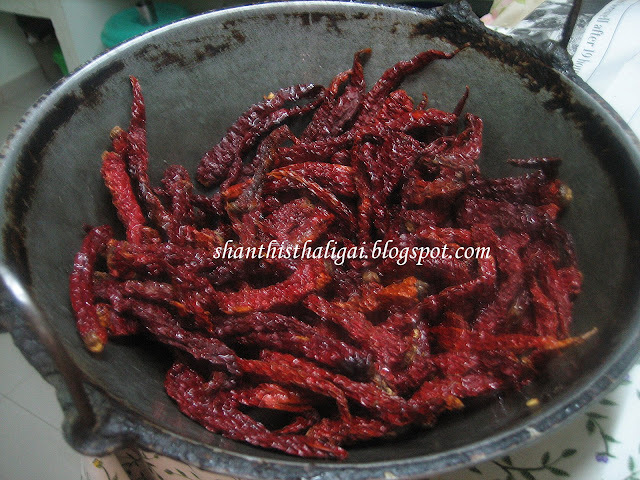 Iam sure freshly ground chilly gives a nice flavour.Yummy with curd rice. Mouthwatering pickle, makes me grab one right now. yummy pickle.. 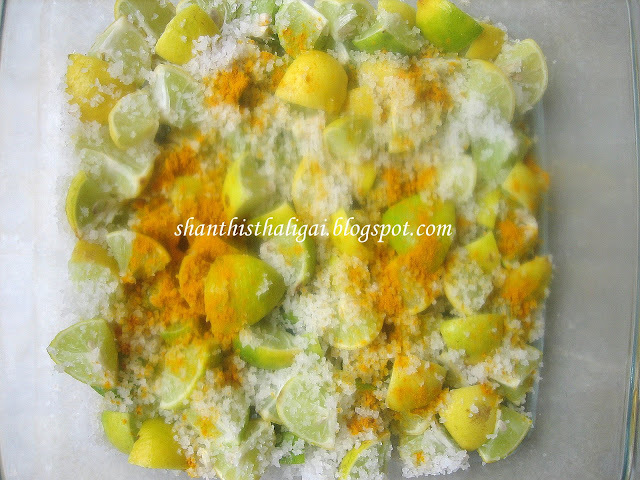 I am drooling here .. feel like having curd rice and pickle now..
Wow Shanthi, Awesome Lemon pickle. THis is my fav too. MY MIL prepares it the same way. 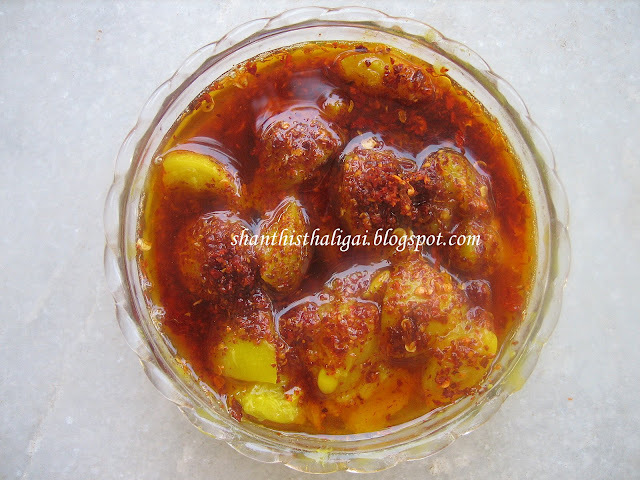 In fact when we came to the US and we were expecting our 1st child, we did not have an Indian store close to our house..it was like 2 1/2 hrs drive..so we made this pickle at home..my MIL told me the recipe over the phone and my DH made it for me...So this PIckle is making me nostalgic. Now where we live..we have 4-5 Indian stores , just 10-15 minutes drive..BUT Yet nothing can compare to this home made lemon Pickle. Awespme Click and love ur step by step pictorial directions. Yummy this is delicious.So well explained and made. wow! !looks so tangy & tempting! !Love to have it with curd rice..Oh YUM!! Maami - Oorga looks brilliant! I'm sure you are enjoying oorga with a side of thayir sadam! LOL! Great recipe - thanks - will try this after my orange pickle is over. picture tutorial is very useful. we love lemon pickle. Mouthwatering...... thats it ..... no other words Shantiji!!!! i haven't tried making pickle any day.. wow! 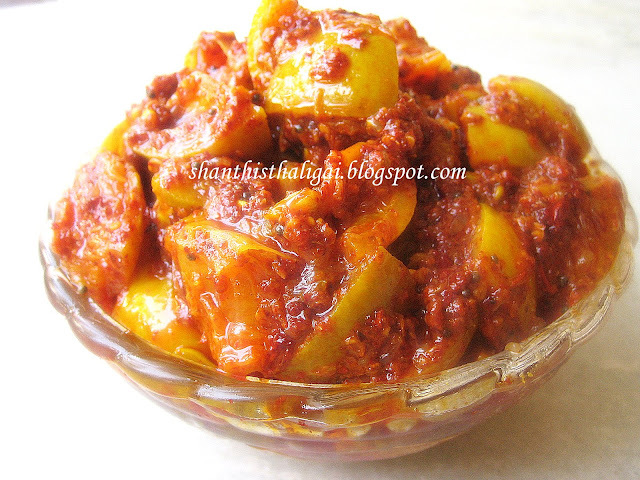 u made it so simple for me..
Wow.... pickle looks mouthwatering and yummy. Pickling is surely an art! 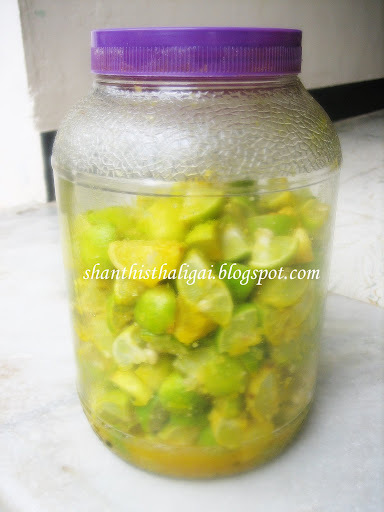 I have never tried my hand at it although I crave for good lemon pickle. Thanks for the detailed step by step procedure Shanthi ji! Elumichangai urugaiya partha udaneye naakula thanni uraruthu. Thanks for the step by step instructions and pics for making this. I have one doubt, do we need to keep the plain lemons mixed with salt in the sun. Here I do not have much sunlight, so poonjakaalan pudichidaruthu. Please advice. Do not keep in sun and not necessary also. 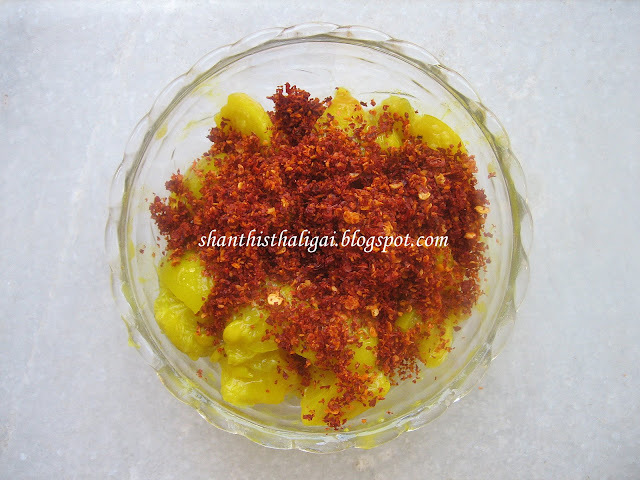 My hubby's favorite pickle.I don't know how to prepare.Thanks for sharing with us.Nice step by step clicks. Pickle came out very well. Thus recipe is a keeper. Best lemon pickle ever.